Make Sure Your Brochure is Doing Its Job and Doing It Right. Your brochures should be an active and productive part of your company’s success. Can you identify the goals and roles of the literature you re putting in your prospects hands? More importantly, are you putting that literature into their hands — or is it collecting dust on a counter? Get Your Brochures in the Customers Hands. Too often, brochures end up being unused. Maybe their color is fading on the counter-top display. Or collecting dust in a rep’s storage area. Could be they are just colorful decorations to impress the boss. If this is your brochure, you’ve wasted your money. Brochures should support your sales and marketing efforts. A good brochure can almost place the product or service in the palm of your prospects hands with vivid, concrete details. Hand your brochures out to everyone that comes in your retail store, leave them behind on every sales call, and get them in front of potential investors. Provide Information and Provoke Action by Pushing Benefits. Tell the reader what your product/service/company is about (EXPLAIN), Sell the reader on how they benefit (SHOW). Help the reader participate with your company by taking the next step. (PERSUADE). Whether your brochure is a sales brochure, an informational brochure or a corporate brochure, by using the ESP formula above, you can be confident your brochure is doing the job. 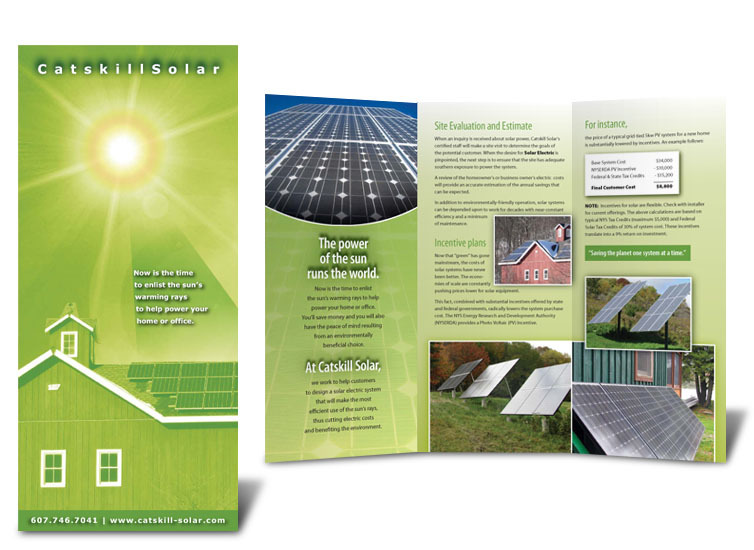 Know The Goal of Your Brochure. Almost every brochure falls into one of three categories: Selling a product or service (sales brochure), teach something new (informational brochure) or brand awareness (corporate brochure). While some brochures may have more than one role, almost every brochure should touch one at least one of these otherwise you ve either wasted your money or maybe you need to use a different piece of literature. The information that goes into the brochure should always communicate your unique sales position (USP) and direct the reader on how to do business with you. Even if the brochure is strictly brand awareness, include an offer or direct the customer onto the next step of doing business with your company. If you have a product that would take a technical manual to communicate all the benefits and features, consider including more graphics such as charts, photos and testimonials. Make sure that each graphic represents a benefit the reader can identify with. It may be wise to create multiple brochures if your company targets different clientele. For instance, a self-storage company may want to create one brochure for homeowners, another for small businesses, and yet another for boat and RV owners. Some of the benefits will be similar so much of the content can be the same. The main differences will be in the headlines and subheads. Brochures can also be used to inform readers of technical specifications, corporate strategy or upcoming events. Make sure you know the audience for your brochure. In today’s fast-paced, sales literature heavy world, we are all prone to scan. You probably do it. I know I do it. You can count on your prospects doing it. The headline on the front of your brochure must compel the reader to open the brochure. Once they have it open, the subheads and graphics catch their eye before the text. Your subheads should either be explaining your USP or asking questions that get the reader in the habit of saying yes . If you find your subheads are too long, use an ellipsis this will keep them reading. Another technique that keeps them reading is to put copy in a text box or table. Use testimonials, a checklist of benefits or your USP to ensure that your message gets across. Remember, the result of your brochure should be the reader knowing how to contact you and why they are doing so. Always include contact information and your offer multiple times within the brochure. Mike Sansone is a Freelance Copywriter in Des Moines, Iowa, but is often called to work from coast-to-coast and border-to-border. To contact him or see more of his work, you can visit his website at www.copywritingsolutions.com. Great tops here for marketing with brochures. Even today, I believe brochures can still do their job at introducing and marketing products and services. For those designers out there, I do recommend though that you go minimalist for a business brochure design. Definitely, it makes for a more compelling brochure.